Not limited to the Metro area, we go anywhere from the northwest region to the southeast region of Minnesota. Call/Text us at: 651-485-6870 or submit an email Request Below! "Ivan and his crew did a great job. He gave us a fair estimate. My husband and I were impressed by the excellence outstanding work professionalism Job that Ivan and his crew did. They did a very good job cutting my huge tree. They cleaned up everything. Ivan did complete the work as promised." "I appreciate the professional service you provided for the removal of a troublesome tree. You, and your crew/family did a very fast, thorough, and complete job. From the cutting to the clean-up. Thanks again for your fine service! "Ivan and his team did a great job on cutting down a large tree in my yard. They did it quickly, carefully, and at a good price. "Thanks again for a fine job." "I cannot say enough good about my experience with Ivan's Tree Service. Prompt, courteous, friendly, excellent cleanup, professional, reasonable priced, and it just goes on and on. Ivan's did such great job that I took them to another property that same day for some quick trimming." "Ivan and his team were very kind, professional, and a pleasure to work with. I would hire him again and feel comfortable referring him to anyone I know!" "I'd like to say thank you to you and your team for doing such an outstanding job today! You are all very professional, efficient, and I appreciate that you completely cleaned everything up! I'll be calling on you again as needed. Thanks so much." 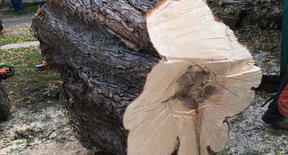 "Ivan’s Tree Service did a fine job for us at a reasonable price. His crew was particularly careful of the perennial gardens directly under the huge elm that had to be removed. We will be having them back again soon!"